The struggle of finding room for all your stuff is real. Living in a small space is not as fun as all those tiny apartments on Instagram make it look. Anyone who ever experienced living in a small apartment knows the real struggle and all the challenges, a small space living comes with. However, it does not mean you should immediately move out or stop thinking to redesign it. With prudent planning and forethought, a small space can become equally functional and striking. If you are also low on square footage and are not sure where to start - read on the following post to find some authentic tips to help design small spaces. 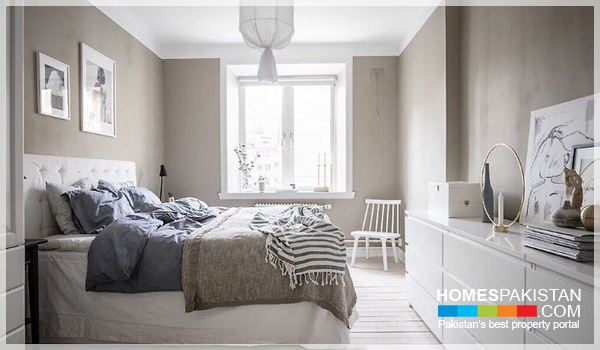 Choosing the right paint colour for your small home or apartment can instantly give the impression of bigger and wider space. Traditional colour palette of white, cream and grey make great options because they provide a neat, clean and streamlined look that makes room feel brighter and bigger. Moreover, painting the ceiling white can create a visual openness. Just by inculcating right colours, you can have an inviting and vast space in no time. Dark colours always emphasize the smallness of the room by giving it a den like effect. It means, choosing the right kind of colour can help you get the effect you want in the most affordable manner. When it comes to decorating a small space and giving it an expansive look, mirrors play the most crucial role. You can adjust different kinds of mirror within gallery wall or wall adjacent to window to make the space appear brighter and bigger. Never underestimate the impact of a well-placed and right sized mirror in a room. Be it a decorative one or intentionally hanged on the wall for design purpose, the mirror can make a small space feel open and streamlined. When you are low on square footage, it is important to have multifunctional furniture. Choose a daybed that can be used for lounging but can also be used as an additional bed for guests. Choose furniture that have hidden storage spaces and serve multiple functions or go for pieces that you can compact and store, when not in use. If you can�t fit a dresser into your bedroom, try using drawers under the bed for clothing and extra things. Make sure that every furniture item in the room has a purpose, without sacrificing aesthetics or appeal of the place. Limited square footage does not mean you will have to sacrifice important things or compromise on the style. Follow these tips and you will get an open and inviting space in no time.